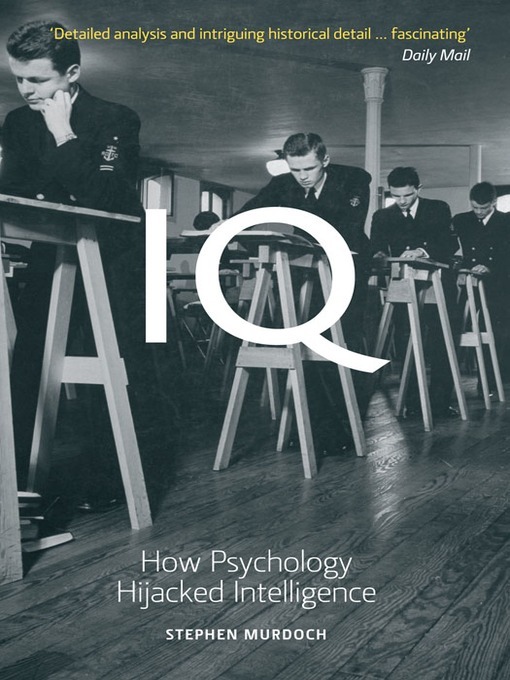 Summary (from the back flap of the book): How could IQ testing, which has only ever been a rough guide ot ability, have come to be seen as an objective and infallible measure of intelligence--even of human merit? 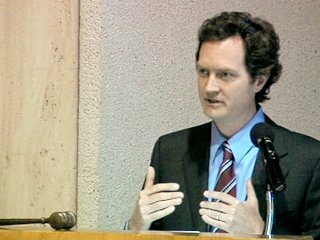 In the first popular history of the intelligence test, Stephen Murdoch reveals how psychologists promoted themselves by championing IQ tests at a time when universal education, mass immigration into the US, and the demands of mobilization in WWI created the need for new ways of processing people. IQ tests were used to decide whether people could settle in a new country, whether they could reproduce, even whether they lived or died, but while they do have some predictive power, IQ tests don't explain people's capacity to think and understand the world around them. Could the concept of reshaping society based on exam results ever be a good idea? Review: Let's get a few things out in the open right off the bat: (1) The author is my brother. Does that create bias in my review. Very possibly. However, this book came out in 2007 and I haven't read it until now so you know I am not the perfect older sister who is pushing this book because it's family. (2) I hate IQ tests and standardized testing in general so I do have a bias about the book topic (but, don't we usually if we're honest with ourselves?). (3) I am dying to know my IQ because I want to know that I am "smart". This book is not a dry history of the IQ test nor is it filled with statistics and data. Rather it is a narrative history of how IQ tests came about in the late 1800s/early 1900s and how they have been used against various citizens ever since. There are chapters devoted to the major players in the IQ test game: Francis Galton (Charles Darwin's cousin); James Cattell; Alfred Binet; and Henry Herbert Goddard among others. Later chapters look at uses of the IQ tests over the past 100 years in the US, the United Kingdom, and in Germany. While both positive and negative uses of IQ tests can be produced by people on both sides of the testing argument, the reader needs to know that Murdoch comes down on the side of "these tests have been misused", showing the mistreatment of people for decades based on test scores. He highlights students taking the 11-plus exam in Britain as a means to determine their future education and careers, sterilization of the "feeble-minded" in the US, determining who entered the US through Ellis Island, killing of the "mentally handicapped" in Nazi Germany, and a country's view of African-Americans. In the beginning of the book one of the things that really struck me is the names used to describe people who did not do well on these tests: morons; idiots; feeble-minded; sub-normal; mongoloid; retarded; etc. I got quite uncomfortable reading those words over and over, realizing that the word retarded was the term we used when I was growing up in the 1970s and '80s. Our culture is really fixated on IQ. In order to enter honors programs students still take a version of an IQ test. The Internet is filled with "3-minute IQ tests" and sites that claim they can reveal your IQ. I know that I have taken a number of IQ tests (real and online) over the years. Deep down I want to know my score and I don't. If it's high I will feel better about myself, but if it's low I know that I will internalize that number and defeat myself. Maybe that's just my personality, but I think assigning a number to our "smarts" is dangerous. How about you? Do you know your IQ? Do you want to know it? Click to see my updated Google Map. It's difficult to have a geography question for a book that isn't rooted in one particular place. But, Murdoch includes chapters on the US, United Kingdom and Germany. I understand you when you say about those names - the years when I grew up, they were already taboo, so I heard very little of them. Sure, we still used words like stupid and idiot, but only when we mean them playfully, never when we really come across mentally challenged people. I'm not a supporter of IQ tests either. I've taken them once as a child, because I wanted to know how "smart" I was, but over time, I've just shunned them - they just never made sense to me. Btw, your brother looks JUST like you! I'm sure you've heard that a lot! I admit I've always been curious about my IQ, but hesitant at the same time because I wouldn't want to see a low score. There's an awful lot wrapped up in the idea of a number that says how "smart" you are.